Let's start with a recap of bad news after bad news. It all started with “#DengGate: Aquino’s Garin ignores WHO warning”, where I explained how the Aquino Government, disregarding warnings from experts, hastily misappropriated Php 3.5 billion in public funds for purchasing untested dengue Vaccines and administering them to over 700,000 Filipino fourth graders, unnecessarily putting their lives in danger. The Health Department swiftly attempted to allay fears when newly-installed Secretary Francisco Duque said there’s a 30-month protective period starting from the first dose, suggesting that victims still have time to prepare for when the real risk for severe dengue kicks in. Unfortunately, that 30-month protective period has been debunked in “#DengGate: Kid in ICU for dengue only 3 months after 3rd dose”. Worse, it appears that officials within the Department of Health itself are trying to mount a massive coverup, as shown in “#DengGate: Botched Tarlac Dengvaxia case hints DoH-led coverup”. Public exasperation over this health debacle can better be described with “#DengGate: A Dengvaxia Victim’s mother writes to Health Sec. Duque”, where a mother of a Dengvaxia victim appealed to the government for the sake of her child. With the “protective period” turning out to be a myth and with hundreds of thousands of parents worried, what should be done? In “#DengGate: Dear Mr. President, here’s the memo you asked for”, I explained the situation to President Duterte, who appears to be surrounded by health advisers that harbor serious conflicts of interest. In that “memo”, I suggested that de-escalation through information dissemination, i.e. informing parents about what can be done, should be the first thing the current government must do. But the Health Department’s suggestion – consulting doctors – is too expensive for many of the victims, whose parents earn less than US$10 a day, so we must tap our network of government health centers for information dissemination. However, in last week’s “#DengGate: Garin’s P4.8-billion botched, overpriced Health Center Project”, I explained how the Aquino Government, through Budget Secretary Florencio “Butch” Abad, Health Secretary Janette Garin, and PhilHealth CEO Alexander “Alex” Padilla, illegally siphoned off Php 10.6 billion pesos in PhilHealth funds to bankroll a multi-billion-peso massively overpriced health center project that’s just 10% complete almost a year after its oft-extended deadline. Yes, the previous government even “tinkered” with health centers, leaving almost 1,000 villages in the affected regions without a health center for the next decade or so. Again, the story started with the Php 3.5-billion illegal purchase of defective vaccines, which evolved in what appears to be a massive government-led coverup. The story further included another Php 4.8-billion corruption scandal involving health centers. The deeper I dug, the bigger worms I discovered... and here, my friends, are more worms. The Expanded Senior Citizens’ Act of 2010 [RA 9994] provides free medical insurance coverage to senior citizens, defined as Filipinos aged 60 and above, made possible by a combination of the Sin Tax Law [RA 10351] and [RA 10645]. Let me explain that more clearly. After deducting the small share of tobacco farmers, 80% of Sin Taxes (taxes levied on Liquor and Tobacco) go to PhilHealth. Furthermore, RA 10645 requires a part of that 80% to be reserved for the cost of PhilHealth coverage for Filipino seniors. Php 10.6 billion from sin taxes was supposedly allocated for senior citizens for the year 2015. However, in an August 2015 letter to Department of Budget and Management Secretary Butch Abad, Health Secretary Janette Garin and PhilHealth CEO Alexander Padilla said PhilHealth doesn’t need the money anymore, that PhilHealth can cover all seniors even without the Php 10.6 billion from sin tax. Garin also sits as PhilHealth’s chairman of the board at the time, by virtue of her being the Secretary of Health. With this premise, Padilla and Garin asked Abad to realign the Php 10.6 billion towards the Department of Health’s Health Facilities Enhancement Program, with about half of the amount (Php 5.3-billion) earmarked for the botched school-based barangay health center construction project. Garin and Padilla's letter to Abad. The 2015 realignment, in itself, is already illegal per a February 2015 Supreme Court decision on the Disbursement Acceleration Program (DAP) [SC GR 209287]. But there’s a bigger problem: Padilla and Garin, as agents of Philhealth, let go of the massive Php 10.6-billion subsidy despite the fact that PhilHealth was struggling to pay claims of senior citizen members, and despite the fact that PhilHealth, as a whole, was on the verge of bankruptcy. In 10 March 2016, PhilHealth board member Eddie Dorotan said the company may go bankrupt by the end of the year as claims payments exceed members’ contributions and income [BicolToday]. ThinkingPinoy, through sources within PhilHealth, obtained copies of PhilHealth board presentations that detailed the true financial position of the government corporation. Based on these documents, Padilla failed to disclose the amount that PhilHealth pays out, which would have put the reserve amount into perspective. That is, Php 128 billion in reserves appears to be a very large amount, but it’s easily overwhelmed by the exponential growth of claims payments compared to the linear (and plateauing growth of premium collections. Moreover, while it’s true that PhilHealth’s reserve fund is increasing, much of it is not liquid enough to address immediate financial needs. 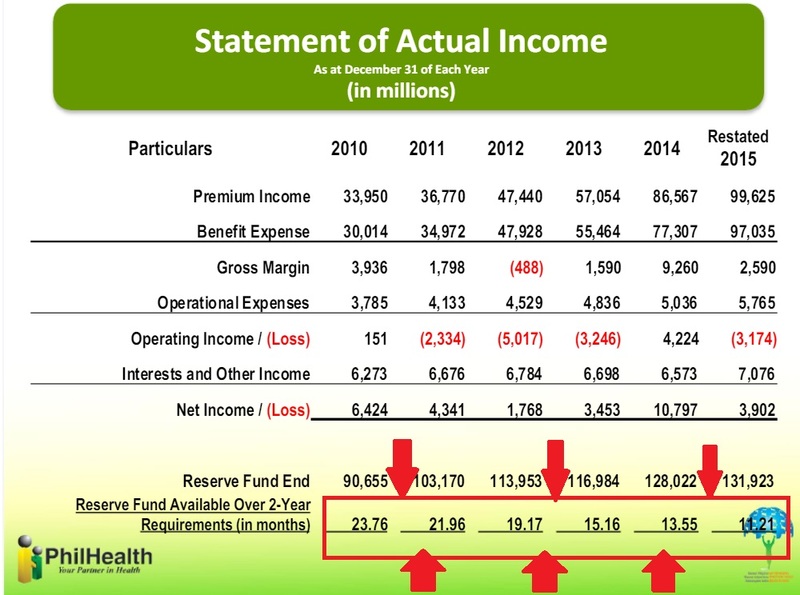 That is, readily available reserve funds are dwindling and are projected to dwindle further, as PhilHealth posts massive operating losses every year. Readily available reserve funds dwindle year after year. Padilla and Garin, the top two PhilHealth officials at the time, turned a blind eye on this reality. 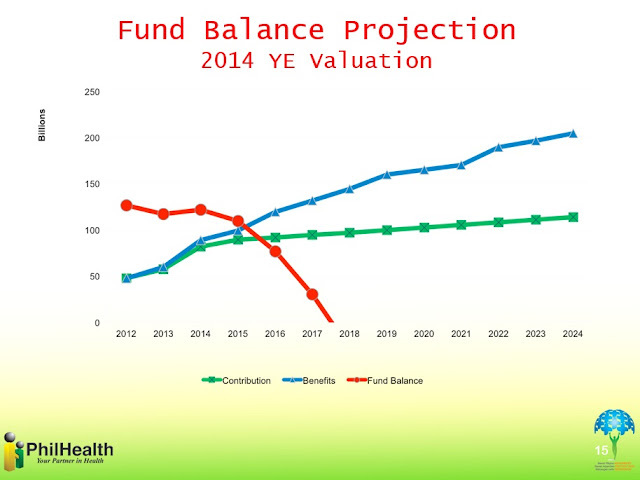 As we can see, all of the three valuations predict that PhilHealth will run out of reserves by mid-2018, as total expenses increase exponentially and projected income increasing linearly (and plateauing). Simply put, all three projections indicate that Philhealth will be BANKRUPT by mid-2018. Again, these projections were made in 2012, 2013, and 2014, meaning that they were readily available to Health Secretary and PhilHealth chair Garin and PhilHealth CEO Padilla. With that said, how on earth did these two manage to claim that PhilHealth can operate WITHOUT the Php 10.6 billion subsidy from sin taxes, the same Php 10.6 billion that they gave away to the Health Department? Sources from within PhilHealth informed me that Garin met with DBM to discuss PhilHealth’s finances WITHOUT any other representative from PhilHealth, may that be someone from the actuarial department, the benefits committee, or the risk management committee. Garin and Padilla didn’t care about PhilHealth’s survival: it appears that all they wanted to do with PhilHealth is milk it for all its worth. And in this particular case, Garin, Padilla, and Abad had their eyes set on the Php 10.6 billion for PhilHealth’s senior citizen beneficiaries. 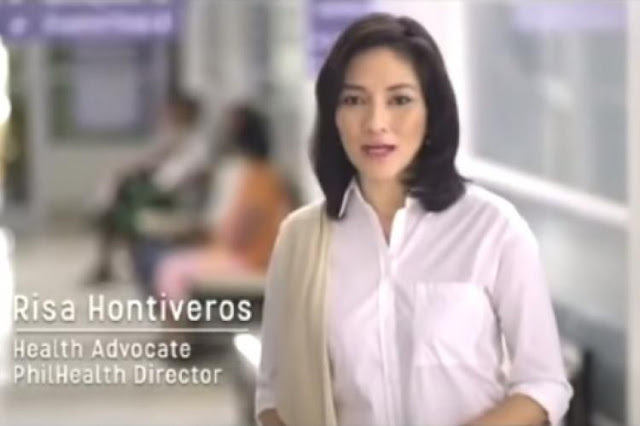 As a side note, it’s comical that then PhilHealth director and current Senator Risa Hontiveros had the gall to take advantage of what little money PhilHealth has to advertise for her 2016 senatorial bid, with some of Hontiveros’s Philhealth TV commercials costing Php 400,000 per 30-second spot. If she indeed cared for the poor, she would have had the delicadeza to beg off, but she did not. PhilHealth spent millions for this ad campaign and Hontiveros was fine with it, despite her full knowledge that PhilHealth is broke. Given this, Hontiveros’ August 2015 excuse – that she “didn’t ask for it” – won’t fly. 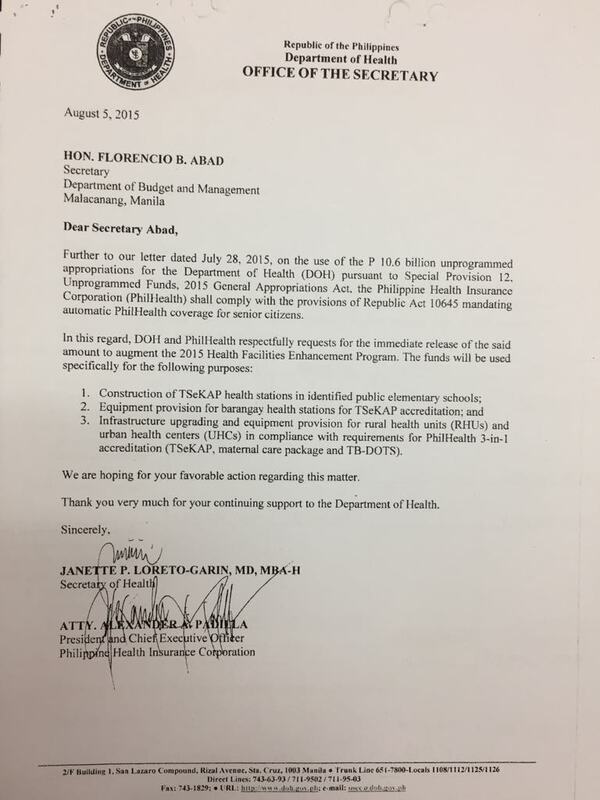 Recall that in the 05 August 2015 letter, Padilla argued that PhilHealth can cover senior citizens even without the Php 10.6-billion subsidy from sin taxes. Padilla was lying. 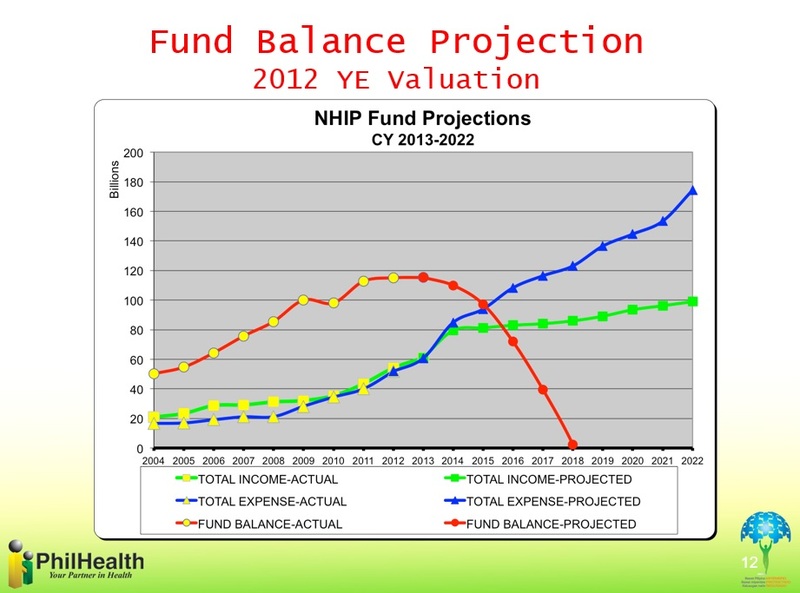 According to another [PhilHealth board presentation] delivered in early 2017, PhilHealth needed Php 2.1 billion to cover senior citizens in 2014, and another Php 13 billion in 2015, for a total of Php 15 billion as of the end of 2015. Adding the fact that fund reserve projections of the past three years strongly suggest impending bankruptcy, how could Padilla and Garin conclude that PhilHealth can live without the Php 10.6 billion sin tax subsidy? Well, it seems that the Aquino Administration planned it from the very start. In short, Aquino didn’t want Congress to hard-code the Php 10.6 billion for PhilHealth and instead insisted that the fund be classified as “unprogrammed”. This makes budget realignments easier to do from a legal standpoint, i.e. the Aquino Government had “plans” for the fund in as early as 2014. Janet Napoles’ PDAF Scam involves Php 10-billion in public funds [SunStar]. This one is 600 million pesos more than that. I have reason to believe that this Php 10.6-billion PhilHealth scam is more than just a simple case of Technical Malversation, as the entire issue appears to been heavily pre-meditated, as evidenced by Aquino’s 2014 veto message. This is made possible through a weakness of the Sin Tax Law, which allows for the “soft earmarking” for health expenses during national budget deliberations, as opposed to programmed funding or mandatory allocations that would have made realignments harder to perform. The earmarking of Sin Tax Law (STL) revenues is “soft” earmarking, though STL revenues are allocated through the annual budgeting process, and annual allocations are considered simultaneously with the overall budgets of the government agencies concerned. In short, this legal “weakness” paved the way for budgetary “magic”. I guess we should stop wondering why Garin and Padilla defied logic as they requested for the realignment: they had to do it no matter what, because Aquino and Abad were very much interested in it all along. And we all know where half of the illegally realigned Php 10.6-billion went: to the botched, overpriced, and unfinished health center construction project. As for the other half, I still do not know. But now that I’ve talked about corruption in public healthcare, I might as well take a bird’s eye view of the matter and investigate other corrupt practices in PhilHealth and the Department of Health. Politicians have historically abused PDAF (Pork Barrel) Funds for their own benefit, and this was the most popular – and most lucrative – avenue for corruption for a long time. The Supreme Court, however, effectively stopped this practice when it declared PDAF unconstitutional in November 2013 [SC GR 208566], as private citizens filed cases questioning its legality in the aftermath of the Janet Napoles PDAF Scam. With no PDAF to take advantage of, corrupt politicians had to look elsewhere… and they found sin taxes. But one can’t just steal money straight from sin taxes: there’s an art to it. As explained in earlier sections, sin taxes are taxes levied on liquor and tobacco products. After tobacco farmers get their small share per statutory provisions, 80% of the remainder goes to PhilHealth while the rest goes to the Department of Health. Anyone knowledgeable with PhilHealth’s finances will agree that Sin Taxes saved PhilHealth. What many may not be aware of, however, is the magnitude of liquidity that Sin Taxes provided not only to PhilHealth, but the Department of Health as well. Enacted in 2012, the Philippine Sin Tax Law astronomically increased the Health Budget. 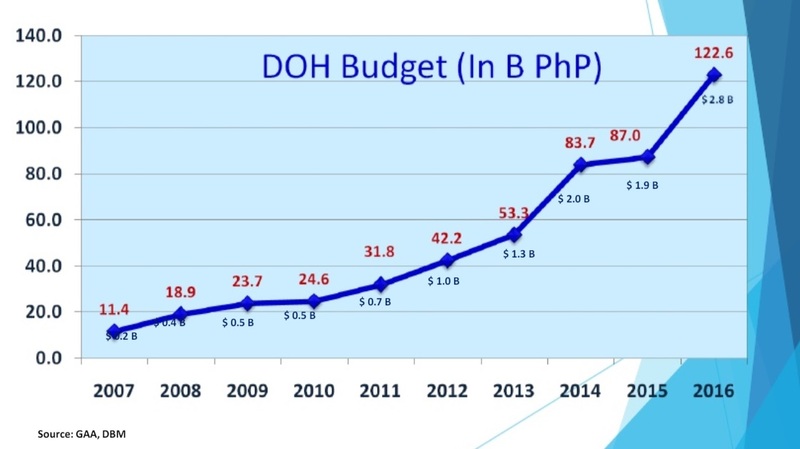 DoH, which had an average annual budget of Php 30-billion from 2009-2012, suddenly enjoyed an average annual budget of Php 87-billion from 2013-2016. In 2016, DoH had Php 122.6 billion, or thrice its 2012 budget of Php 42-billion. Simply put, sin taxes made the Health Secretary the “richest” secretary in the Cabinet. And where there’s money, there’s corruption. The first thing that probably came to your mind would be the PhilHealth cards that politicians typically give away to their constituents as a form of patronage politics, where would-be voters mistakenly feel the need to support a given politician in order to receive government benefits. That’s right. That happens. But there’s something far more sinister than that. In late July 2015, Philhealth issued [Circular No. 018-2015], which basically limits eye doctors to 50 cataract claims per month. This was after Philhealth discovered that doctors have been abusing PhilHealth as they claimed large numbers of bogus cataract surgeries in order to collect benefit claims. PhilHealth pays Php 16,000 per cataract surgery, an outpatient procedure that lasts only 15 minutes. According to highly-placed sources within PhilHealth, some doctors performed cataract surgeries even on patients with no cataracts, while some charged PhilHealth even without operating on anyone at all. In early July 2015, for example, 10 doctors claimed Php 500 million in total from PhilHealth [Star], 9 of them being eye doctors. For 2014, PhilHealth paid P2-billion in cataract claims alone [PhilHealth]. That’s about 125,000 cataract procedures! It would have been great if PhilHealth gets to catch abusive doctors, but the sad reality is that extensive audits, which allow PhilHealth to detect fraud, are done mostly in NCR hospitals, so that provincial hospitals can still get away with it. Now, add the fact that Philhealth paid Php 78-billion more in 2014 than it did in 2013, a 41% increase. While increases may be attributed to increased coverage, such a drastic increase in such a short span of time suggests that there’s something fishy going on. According to PhilHealth sources, many doctors and their politician “business partners” have started to either  prescribe unnecessary procedures or  claim “ghost” procedures, in order to increase their claims. And it also helps that local politicians control local arms of the Department of Health, while others actually own hospitals. For example, a number of major eye clinics actually have politicians as co-investors. But some corrupt politicians take it a step further. In Tarlac Province, for example, Governor Vic Yap in 2015 withheld professional fees of government doctors at the Tarlac Provincial Hospital (TPH) [Inq], an issue that has yet to resolved up to this day. TPH has been losing doctors left and right since then [Inq]. So where did the withheld money go? Take a guess. Have we seen any investigation conducted by Ombudsman Conchita Carpio-Morales that actually yielded something? No, but that’s expected, as Morales appears to be one of the staunchest protectors of the Aquinos [TP: Mamasapano Trojan Horse]. The list of corrupt practices goes on, and on, and on. Remember that PhilHealth alone receives over P35-billion in sin tax subsidies annually: that's Php 35-billion to play with each year [BW]. To cut the long story short, corruption and fraud almost brought PhilHealth into a downward spiral into bankruptcy. Despite this, Health Sec. Garin and PhilHealth CEO Padilla still insisted that PhilHealth can live without the Php 10.6 billion sin tax subsidy. What’s so special about that amount? Funneling Php 10.6-billion to local hospitals means Garin and Padilla get a cut only after the local politicians get theirs. However, if Php 10.6-billion is awarded to just a few entities for a national-level contract, such as the botched Php 4.8 health center project, then they can possibly get a bigger cut. Good thing Roxas lost 2016. Otherwise, PhilHealth will be gone in just a year or two. Through the General Appropriations act, the Duterte Administration reportedly extended to PhilHealth a Php 36-billion lifeline to keep the state insurance company alive, and steps are being taken to fix its finances. But what happens after Duterte's term? 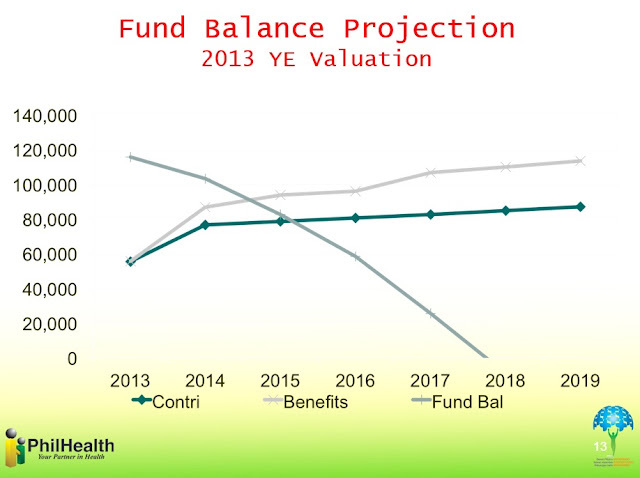 Will PhilHealth go back to the way it was? Lots of corruption happens in PhilHealth and the rest of the public healthcare system, and I think President Duterte has a long way to go in as far as cleaning the PhilHealth and the DoH. Sin Taxes are intended not just to provide token coverage: it's intended to provide the best quality healthcare to Filipinos that the country can afford. If there's no corruption in Public Healthcare, we can actually afford a lot, lot more. But as the saying goes, every journey starts with one step, so let the first step be an investigation against Padilla, Garin, Abad, and Aquino, for conspiring to defraud our senior citizens. Oh, and another against Senator Risa Hontiveros too, for committing graft. The evidence is already there [ThinkingPinoy].